Smart Home products have a habit of giving me something I never knew I needed, but now can’t imagine living without. The Tapplock one smart padlock is such a device. After testing out this smart lock, I think back and wonder how I went through high school and countless trips to the gym using my clunky old combination lock without going crazy. Smart locks are becoming an integral part of the connected home experience, and we’ve already taken a look at some that’ve come through the Newegg offices: from biometric fingerprint door locks to to Bluetooth deadbolts and keyboxes. The $99 Tapplock one is the first smart padlock that’s come through for review, so I was excited to put it through its paces. The Tapplock one is the debut product from the appropriately named Canadian company Tapplock. An Indiegogo success story, Tapplock raised over $300,000 USD to create and launch a line of smart locks that they promoted as “security at your fingertips.” Their sales pitch refers to one of the biggest differentiators between the Tapplock and other smart padlocks: the presence of a fingerprint scanner. 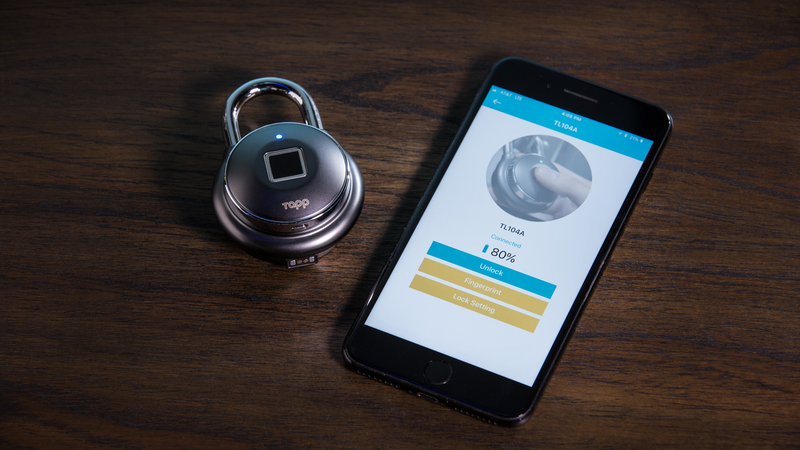 While their competitors typically rely on Bluetooth and either PINs or patterns to unlock, Tapplock opts for the simplicity of the touch of finger, in addition to packing in the requisite Bluetooth connectivity option. I tested the Gun Metal Tapplock one (also available in Silver). The smart lock’s Zemac 3 zinc alloy metal body feels sleek and sturdy, as does the cut-resistant 7mm stainless steel shackle. For security, the Tapplock one boasts a double-layered lock design with anti-pry and anti-shim capabilities (a shim is a thin piece of metal that can be stuck into the base of padlock’s shackle to retract the catch that normally keeps the shackle in place). Although I did not try to break the lock myself, I can say that I couldn’t get anything to fit down into the closed latch to try and “shim” the shackle. I also used the Tapplock for my gym locker a few times, and didn’t notice any damage or tampering. In other words, it seems that the Tapplock is designed to remain safe and secure even over years of use. 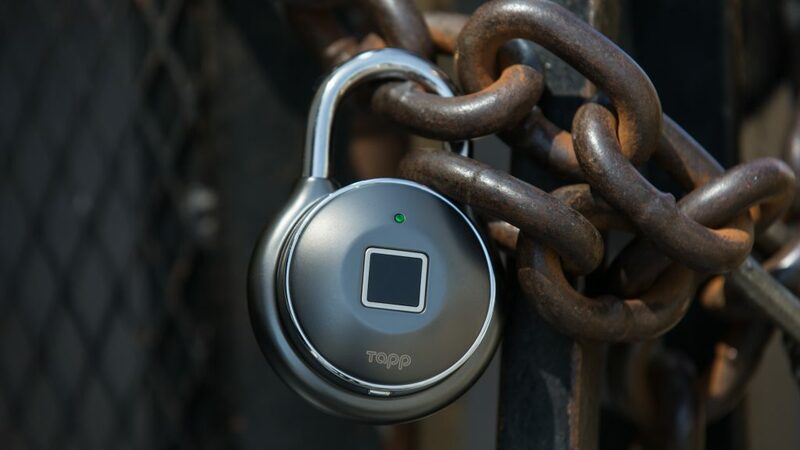 The Tapplock one is also rustproof and IP66 waterproof, meaning it can be left out in the rain – with one caveat: Tapplock mentions that soaking rain conditions push close to IP67 – as long as it is locked. You run the risk of damaging the smart lock if water enters it while the shackle is open. The Tapplock one operates within a temperature range of 14°F to 140°F (-10°C to 60°C). 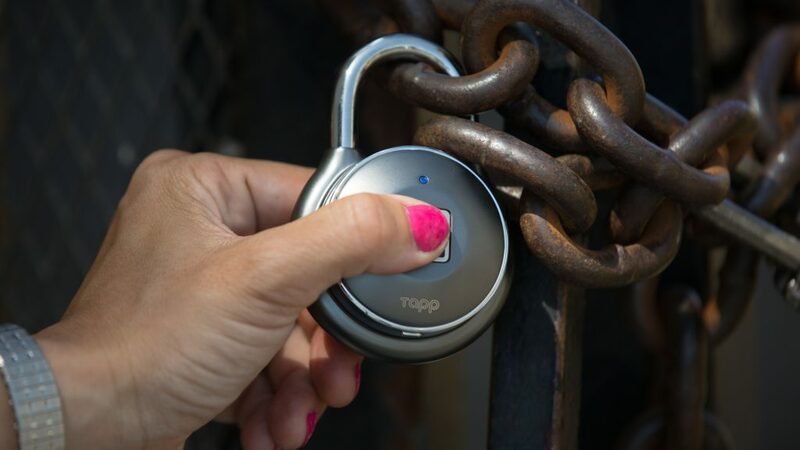 Naturally, operating the lock in the area around Newegg’s Southern California offices, I can use the Tapplock outdoors anytime without temperature concerns. Users in colder climates looking for an outdoor smart lock that can withstand temperatures in the winter months may need to look elsewhere in this case. Upon opening the Tapplock one package, users are greeted with the lock, charging cable, and user manual. Setup is simple: download the Tapplock app from the iOS App Store or Google Play depending on your smartphone, create a Tapplock account, and connect to your new smart lock. The Tapplock app accesses and opens the lock via Bluetooth, and packs in some other nifty features too. The app allows you to create a name for your smart lock and share access with other Tapplock users by searching via email and user name. You can either grant users unlimited access to your smart lock or schedule a timeframe. Sharing access can be done remotely, which is great if you’re away from the lock and need someone to access it in a pinch; on vacation and the person watching your house needs something from the shed? Just have them download the app and schedule an access time for them. As an extra security precaution, you can also revoke access from other users at any time. Fingerprints are added via the app interface: Options are as granular as allowing you to choose the user and which hand and finger you are linking to the lock. 500 fingerprints can be stored in total, and there is no actual limit to the number of users you can add for Bluetooth access, so access limitations shouldn’t be a concern for average users building a Smart Home, even in the case of large companies needing to give employees access to the smart lock. The Tapplock app allows users to check out the Bluetooth and fingerprint unlocking history. The history shows the name of the Tapplock that was opened and the name of the person who opened it. The Bluetooth history also displays the time, date, and location of the unlocking. I was pleasantly surprised by the accuracy of the location data. While most devices can usually get time and date information correct, I’ve tested my fair share of devices and apps that have a rough time even detecting the street I’m on, let alone the correct address. The Tapplock app displayed the correct address for the three locations I unlocked it: the Newegg offices, the gym, and my home. The location accuracy is a huge plus, especially if you’re planning on managing multiple Tapplocks and want to make sure all of them are secure in their proper place. The Bluetooth and fingerprint locking is near-instantaneous. Tapplock quotes the fingerprint access time as 0.8 seconds, which held up under scrutiny through my tests with a stopwatch. Even my “slower” unlocks clocked in under two seconds, so it’s not like you’re going to be standing in front of your locker impatiently tapping your foot while your lock opens. Also, while I do not have access to a Master Lock Bluetooth or Noke padlock, Tapplock states these devices’ average access times as five seconds. If accurate, then what Tapplock has accomplished here is particularly impressive. 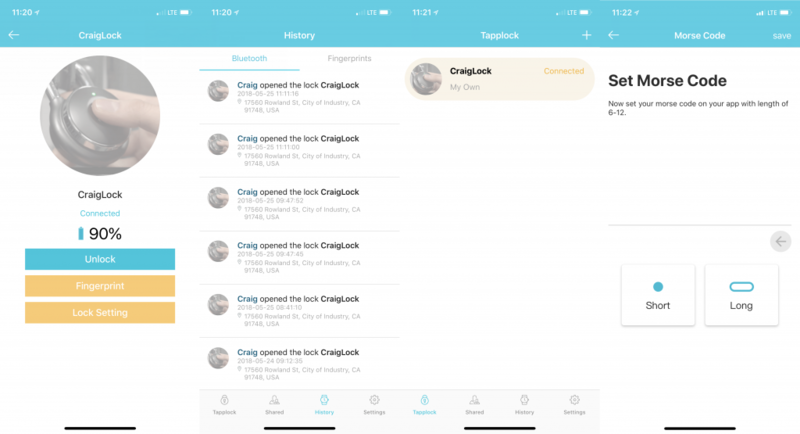 Over the time I tested out the Tapplock one, I never experienced any issues unlocking via Bluetooth, nor did the people to whom I granted access. 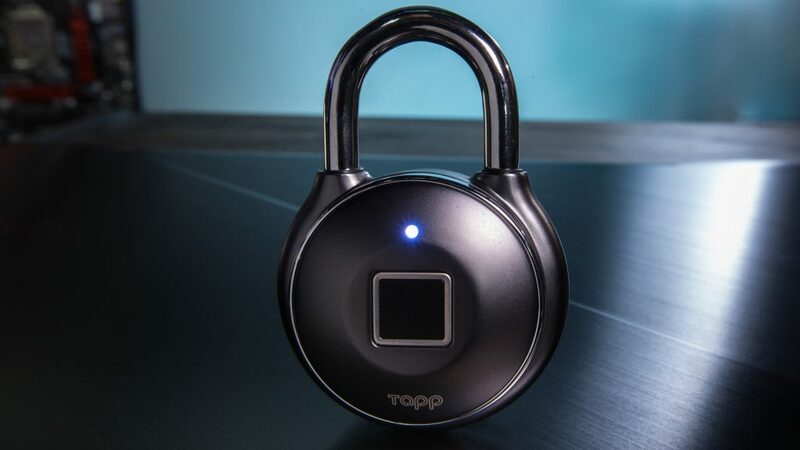 It’s worth noting that the Tapplock enters a powered-down state after use, so Bluetooth mode needs to be enabled by pressing the power button twice before wirelessly unlocking. This means you can’t readily unlock it from across the room, though it’s tough to imagine a scenario where you would need to do so with a padlock. The fingerprint reader was reliable; I rarely ran into occasions where the lock failed to recognize my prints. I found my thumb and index finger to offer the quickest and most reliable unlocks, while I ran into some difficulty setting up and using my ring and little fingers, though I have a hard time imagining choosing those fingers for operating the smart lock. The fingerprint reader maintained reliability even with sweaty fingers. After working up a sweat in the gym, I was still able to unlock the Tapplock without fingerprint recognition issues. I also tested it between washing and drying my hands, in which case it did have difficulty recognizing my fingerprints while they were still soaked, but after even only partially drying them, the Tapplock went right back to dependably unlocking. It should be said that any fingerprint readers I’ve used in the past have always had difficulty detecting fingers drenched in water, so this isn’t a knock on the Tapplock’s accuracy or outside of the norm in any way. The third unlocking method, and one of the coolest features of the Tapplock one, is the ability to unlock via Morse code. Yes, this smart lock allows you to unleash your inner codebreaker and set your own 6-12 digit Morse code through the app. The Morse code feature is activated by pressing the power button on the lock three times. The code is inputted through a combination of long and short power button presses, with long presses representing a Morse code “dash” and short presses representing a “dot.” When inputting your code, the LED turns blue for a short press and white for a long press, so you know you’re pressing down for the correct length of time. The Morse code feature is surprisingly intuitive, even for someone like me who had zero knowledge of how to use Morse code before testing out the Tapplock. I looked up the Morse code alphabet online and set my code to be my corresponding initials. The first I unlocked the Tapplock with my initials, I nearly set out a squeal of delight (I kept it suppressed so as to not get funny looks from everyone at the Newegg offices). Obviously it takes longer to input the Morse code than unlocking via fingerprint or Bluetooth, but it works in a pinch if you are unable to unlock via fingerprint or app. I found the Morse code to be very satisfying to use. It’s a neat little feature and a lot more fun than finicky old school combination locks. The Tapplock one is powered by a rechargeable battery, which is charged via the included magnetic USB cable. This stands in contrast to major competitors like the Noke and Master Lock smart locks, which use watch batteries that must be replaced when they run out. 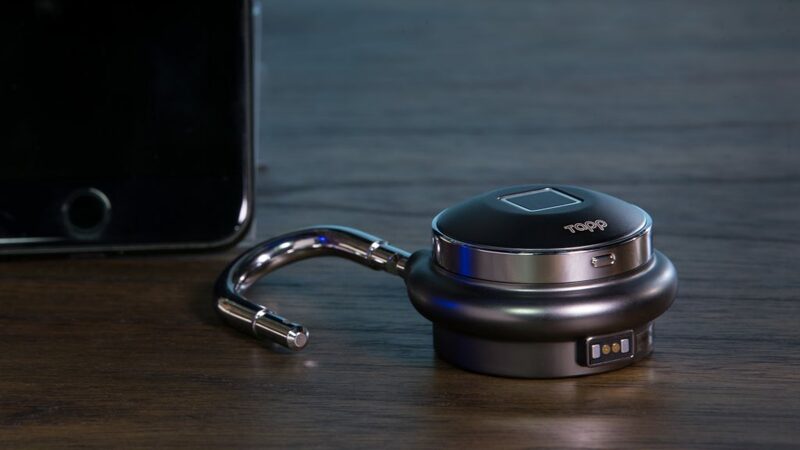 Tapplock quotes a battery life of one year, or 3500 unlocks, off of a single two hour charge, and users can monitor the battery life through the Tapplock app. When the battery is under 10%, users will receive a low battery push notification on their phone and the LED on the lock above the fingerprint reader will flash red. Despite the one year battery life, Tapplock recommends charging the battery every three to six months to ensure a better battery life cycle. In the event the battery runs out, Tapplock recommends using a portable USB charger, which they claim will start the lock up in eight seconds. After a week of usage, and around 100 unlocks, the Tapplock app displayed the battery at 90%, which seems to gel with Tapplock’s claim of a battery life around 3500 unlocks. Assuming the app is an accurate enough measure of battery life, based on my experience, users can likely expect to spend a minimal amount of time with their Tapplock sitting on the charger. Consumers have a lot of choices when it comes to smart locks these days, and smart padlocks are a constantly-expanding niche in this category. In my time with the Tapplock one, I found it to be an excellent and reliable option for easy portable security. I didn’t run into any major accessibility issues, and the few issues I did have were the negligible instances I outlined earlier, like opening with a drenched finger or using my pinky for unlocking. In regular daily operation, it’s unlikely that users will run into detection problems. Anyone in need of lightweight on-the-go security can benefit from checking out the Tapplock one. Its sleek low-profile design, sturdy construction, portable battery, and extensive sharing options make it an exceptional choice for users looking for an easy and modern way to secure their valuables. Smart Home products are developing at a rapid pace, and the new generations are more intuitive than ever. Tapplock one is a smart lock that uses biometric access, Bluetooth, and even Morse code to allow intelligent control over what you need secured. I hate combination locks, but II think I would like this one!